There are times when the world cannot be understood, when it is so overwhelmingly sad, so inexplicably cruel. The events in Manchester are so sickening and indeed, so overbearing that it is far easier for me to hide away from the images of the media, to turn off the news, to put away my phone. Merely contemplating the sudden loss of happy, innocent lives at a once-joyous event and the everlasting grief caused by the madness of this truly evil act is difficult for me to comprehend. Right now, I cannot bring myself to read about the specifics of the actual event nor about the innocent lives that have been lost, of their stories, their dreams and hopes for I do not think I will cope with the personal stories of such tragedy. For those victims who have been taken from this world, I read a silent prayer and send my love to all those grieving by this tragedy. Currently there are no words that can heal those gaping wounds and perhaps there never will be. I have written, throughout my travels, of a deep belief in the goodness of humankind, based on the truly beautiful acts I have witnessed. And yet writing in the aftermath of such depravity seems to contradict every heart warming message I have ever written with a spine tingling jolt of reality. Indeed, tonight I have no wish to write any words, for it is far easier to forget, to ignore, to keep distant, fall asleep and simply embrace another day tomorrow. But it is precisely because of this desire not to write and wish to stay numb that I am deliberately forcing myself to let these words out before sleep takes me away. This act of barbarity is not new, one can simply read throughout the history books of time just how tyrannical​ we have been as humans in the past and still are today. For every act of kindness one can quite easily describe an act of hatred. For every hopeful smile there is a distressed tear, directly caused by the harmful deed of one human on another. I believe it true that there will always be those amongst us intent on hurting one other and this human dynamic I fear will never change, no matter where we live, no matter what age we live in. For this reason, regardless of how much internal peace I feel, there will be regular bouts of epic confusion and sadness within me when such needless atrocities occur. However, the stories that I have been holding onto over the last 24 hours have still left me clinging to my faith in humanity. The story of the homeless man holding an injured victim in his arms as she passed away, the taxi drivers that volunteered to rush people to safety, the lady that sheltered fifty children, the pizza shops delivering food to healthcare workers, the people giving up rooms in their homes, the thousands of people gathering in Manchester today, those donating their blood to the hospitals and indeed the emergency healthcare workers struggling around the clock to care for all those affected. This is the humanity I put my faith into and the humanity I have witnessed, regardless of race, religion and culture, we bind together in times of utmost need. I recently read a Facebook update from my friend in Manchester, a fellow paediatric orthopaedic surgeon who just described working the best part of 24 hours, treating the most severely injured victims, detailing a phenomenal response from the Royal Manchester Children’s Hospital and how everyone remains united. All it takes is one moment of madness to shatter our perceptions of the kindness in this world. However, it is the outpouring of love in this defiant response in Manchester that prove goodness will always triumph over evil, and that humanity will prevail. In this extremely sad time, it is those stories of human bravery, compassion and love I will try to remember when I wake up tomorrow and will keep with me whenever such human inflicted atrocities occur. If for every act of hatred there are one thousand acts of love, the world will always remain a joyful place to me. May God bless those no longer with us. 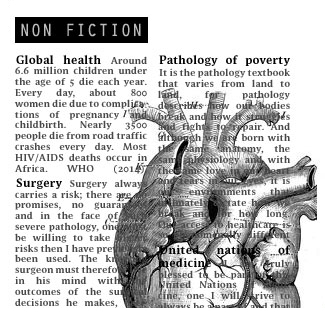 I write about global health, my surgical travels, latest research and the pathology of poverty. I write in hope of a future with worldwide equality in healthcare.